Staying in a cabin built in 1895 in the middle of Central Texas may not initially sound like the definition of a cozy, romantic retreat. 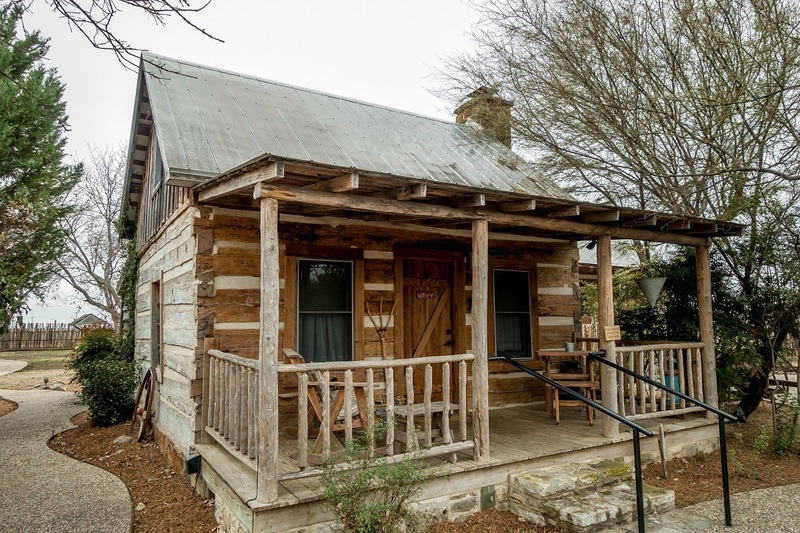 But at the Cotton Gin Village in Fredericksburg, Texas, the combination of rustic details, modern amenities, and food worth writing home about makes for a perfect getaway. In the heart of Texas wine country, the Cotton Gin Village is a lovely bed and breakfast just a couple of miles off Fredericksburg’s main drag of charming shops and restaurants. Better yet, it’s only about 20 minutes from some of the best wineries and one of the most acclaimed distilleries in the state. Most everything you could want to do in the area is only a stone’s throw away. The B&B is composed of seven cabins and “1 Big House” set off of Highway 16. 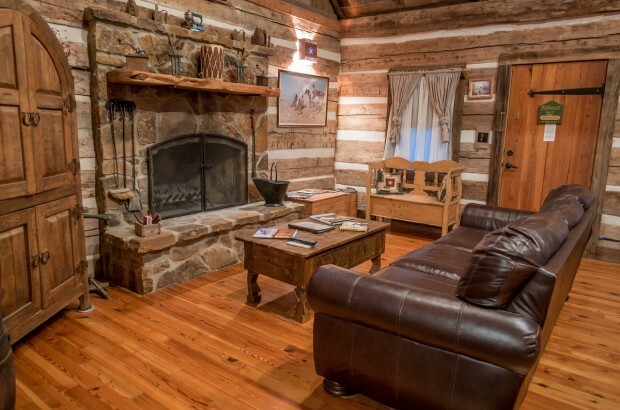 The cabins all date from the late 19th century and were built in either Kentucky or Tennessee, so they are authentically Southern and have a great sense of history about them. 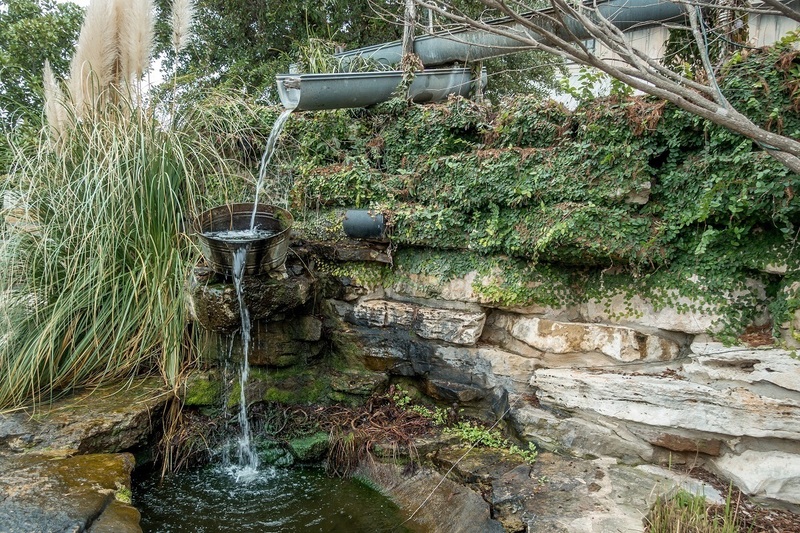 The water features and outdoor space that complete the grounds add to the ambiance. Inside is even better. The front room of my two-room cabin (Llano) had a cushy leather sofa positioned invitingly in front of the stone mantel and wood-burning fireplace – perfect for making s’mores with the ingredients in the kitchen area. The sizable bedroom featured an ultra-comfortable bed, the kind you just sink into. 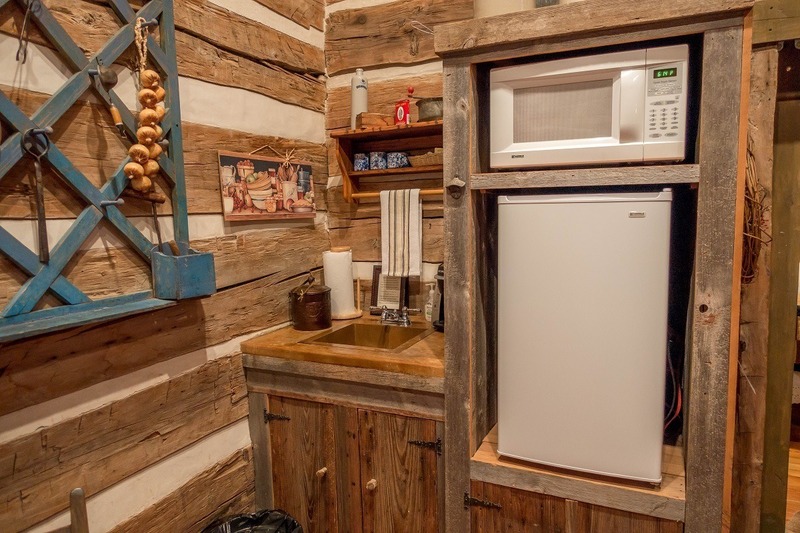 But what impressed me most about the Cotton Gin Village was the blend of modern amenities – flat screen TV, microwave, Jacuzzi tub – with the rustic decorations that help maintain a country feel that seems just right in the Hill Country. 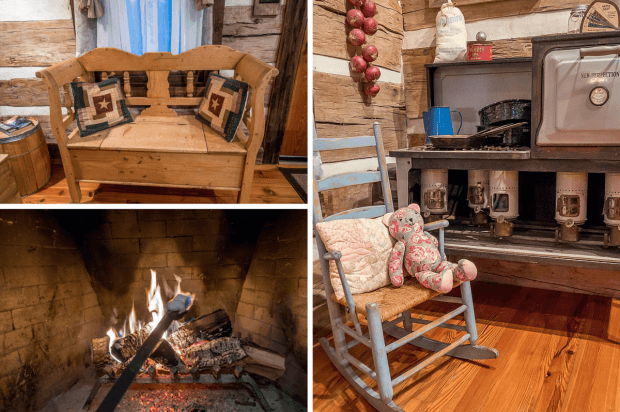 From the hand-stitched quilt emblazoned with the Lone Star to the old-fashioned stove and rocking chair, the details of the space have been given as much attention as the major features. As for the breakfast part of this bed and breakfast, it was extensive, filling, and delicious. 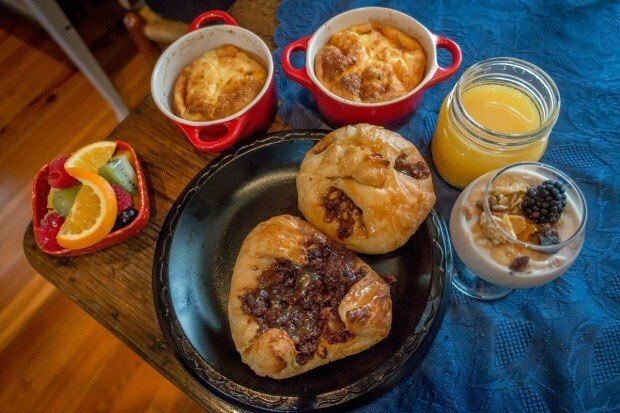 Each morning, a trio of treats was delivered to the cabin in an insulated picnic basket. There was a hot item (souffle, breakfast burrito), a cold item (yogurt, granola), and some of the most amazing (and I’m sure not-at-all fattening) pastries I’ve ever tasted. These were complimented by small mason jars of fresh-squeezed orange juice. It was way more than I could ever eat for breakfast, so several times I found myself taking the pastries with me to nibble on during the day. The Restaurant: While not strictly part of the Cotton Gin Village, the Cabernet Grill shares the same property and owner. One of the most popular restaurants in Fredericksburg, the Cabernet Grill focuses on Hill Country cuisine — steaks, seafood, and other delicious specialties — and has an all-Texas wine list. The amazing breakfast that is delivered to the cabins is also made at the restaurant. An armoire to the left of the mantel housed the flat screen TV and entertainment center. Behind the couch was a kitchen area with microwave, refrigerator, sink, and coffeemaker with 35 different kinds of coffee, tea, and hot chocolate. 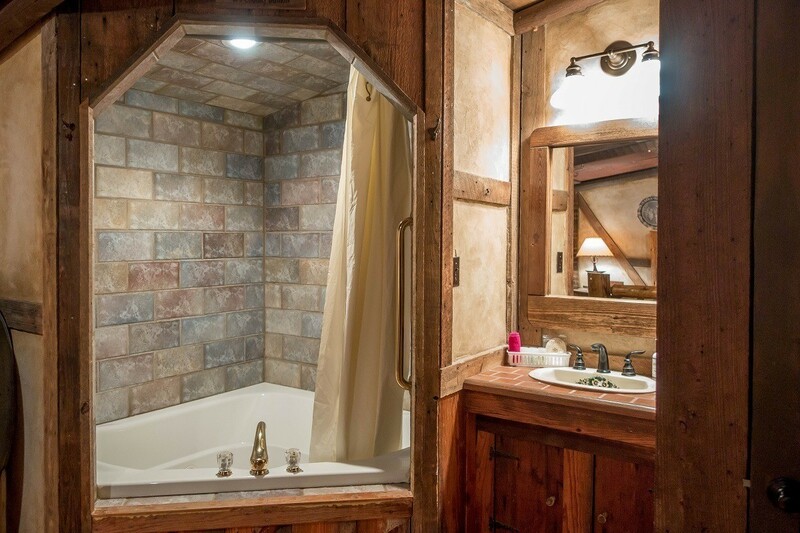 The second room included the bed and several chests along with the bathtub/shower, sink, and toilet (behind a separate door). 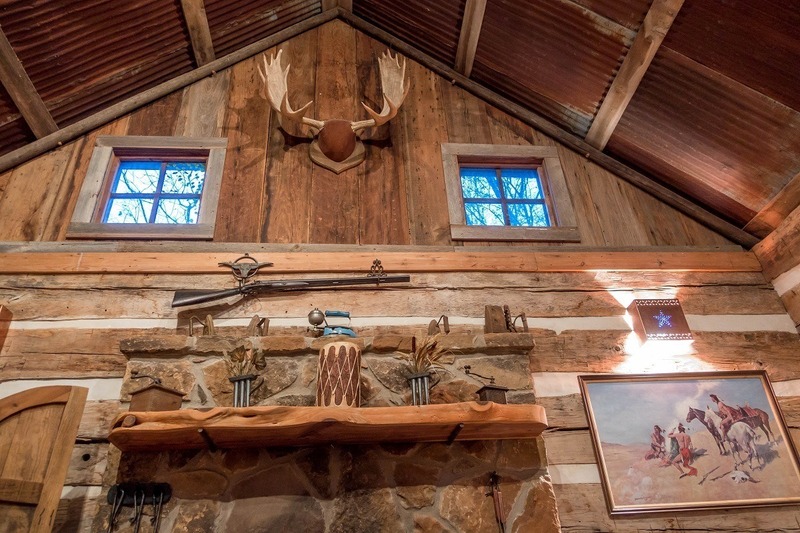 The cabin was decorated in a country motif with lots of character and attention to detail. In warmer weather, you could also enjoy sitting on the front porch with a glass of wine from one of the local vineyards. 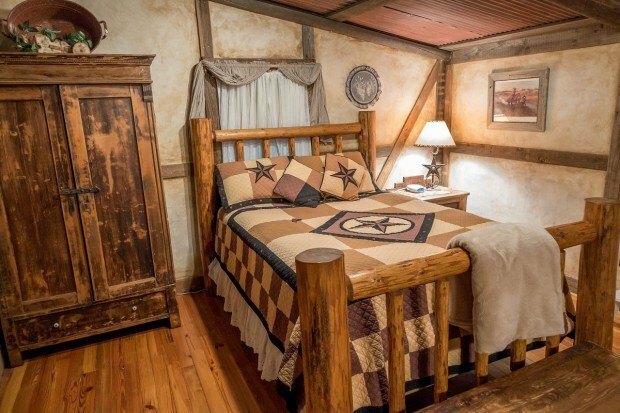 The Bed: The queen-sized bed is super comfortable with a hand-stitched quilt. The WiFi: The cabins and the 1 Big House have separate WiFi networks. In the Llano cabin, WiFi was slightly stronger in the front room than in the bedroom but was good overall. The Television: There is a flat screen TV with cable channels and HBO in each cabin. The Bathroom: The luxurious combination Jacuzzi tub and shower takes up one corner of the bedroom, with a sink and mirror right next to it. The toilet is behind a separate door adjacent to the sink. I visited during an unusually cold February (it was about 30 degrees in the evenings), which may have impacted the hot water heater on one evening of my trip. The management moved to rectify it quickly, but the situation resolved itself within a couple of hours. The Bathroom Amenities: Gilchrist & Soames shampoo, conditioner, and lotion, and a loofah! The hairdryer was also strong (which is a big deal to me). 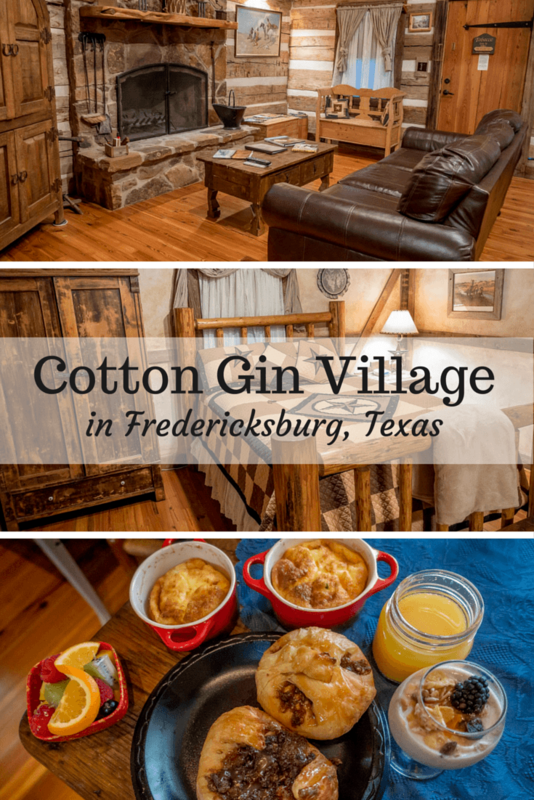 The Location: The Cotton Gin Village is conveniently located approximately 3 miles from Main Street Fredericksburg. The Transportation: Public transportation is not available. There is ample on-site parking just a few steps from all the cabins and the restaurant. The Airport Transfer: The B&B is 84 miles west of Austin-Bergstrom International Airport and 68 miles north of San Antonio International Airport. 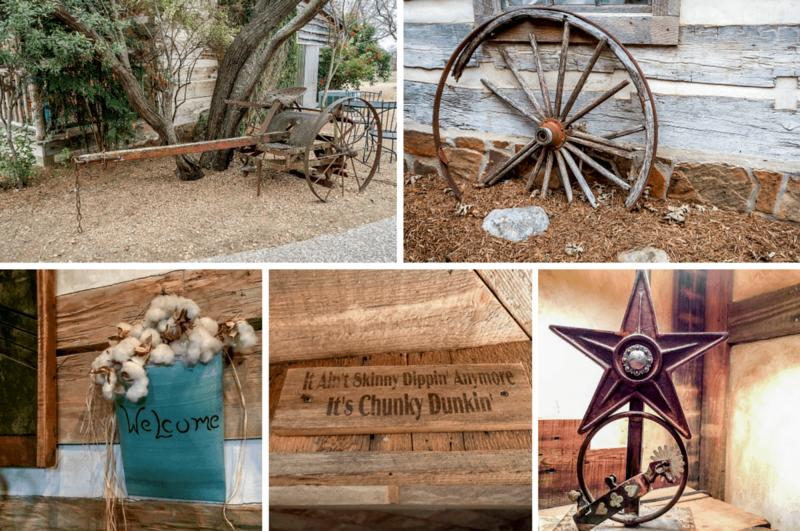 The Cotton Gin Village is the best of both worlds — full of rustic Texas character and high-end amenities. It is cozy and provides a great environment for a relaxing getaway. 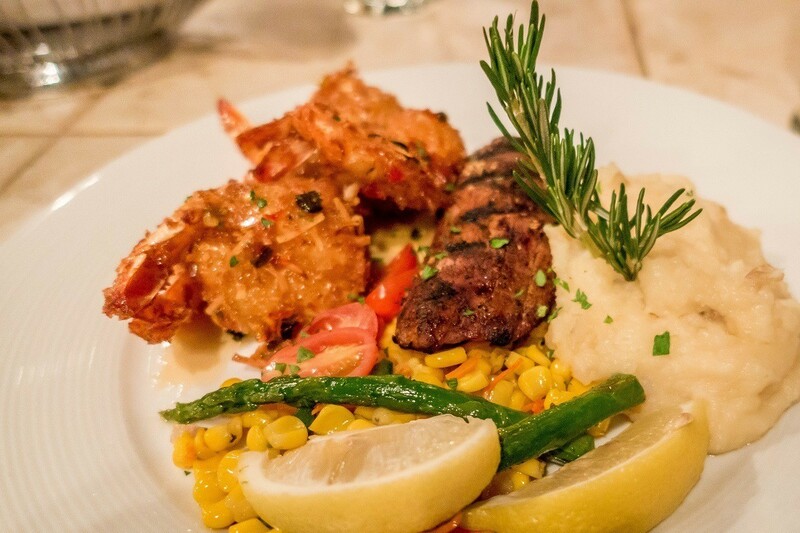 When you add the delicious food and the proximity to Fredericksburg, it can’t be beat. I would absolutely return. I was a guest of the Cotton Gin Village. All opinions of the comfortable and delicious are my own. What do you think about Rustic Comfort at the Cotton Gin Village? This place looks so beautiful and cozy!